A new release of a favorite utility reduces the clutter up top in OS X. Early in OS X’s evolution, only a handful of system items appeared by default or by choice in the menu bar at the far right. Over time, Apple has larded on more drop-down options as monitors have stretched as much as the features you might want quick access to. At the same time, third-party developers have found endless reasons to stick sometimes quite sophisticated controls up there as well. It can be a mess: my basic set comprises 20 items! Bartender ( ) appeared a few years ago to provide a way to reduce the clutter with a lot of control. It seemed briefly imperiled when El Capitan’s technical features were announced, as it relied on modified system settings in a way that the new System Integrity Protection (SIP) mode, turned on by default, wouldn’t allow. Fortunately for Surtees Studios, they had a revamped version 2 already well underway, which works entirely within the new SIP guidelines for El Capitan. It also works with Yosemite. You can control how menu bar items appear: normally, in the Bartender bar, or hidden when not in use. With Bartender 2, you exercise control over your menu bar items, though it may require a restart or disabling and re-enabling each control to let the app take charge; after that initial setup, it manages them from then on. That one-time setup is a small price to pay for El Capitan compatibility. Bartender’s icon can trigger one of three behaviors: dropping down its own bar, which can be repositioned as you like, its default behavior; or hide application menus so that you can see all menu-bar items or just those you haven’t marked as hidden in per-item preferences. Hot keys can be set to bring those modes up regardless of your preference, and to use the keyboard to move through each item. For each menu item, you can choose where and whether it appears: Each menu item can be displayed normally, moved to Bartender’s bar, or hidden. This helps with some system items that otherwise lack a display control, like Spotlight, and some third-party apps that show a menu-bar item whether you like it or not. A nice sub-option for each item is that with it hidden or in the Bartender bar, you can check Show Item in Menu Bar for Item Updates. Whenever there’s an update to the display of the icon or text, Bartender will promote it to the main system menu bar for a selectable period of time from 5 seconds to 10 minutes. 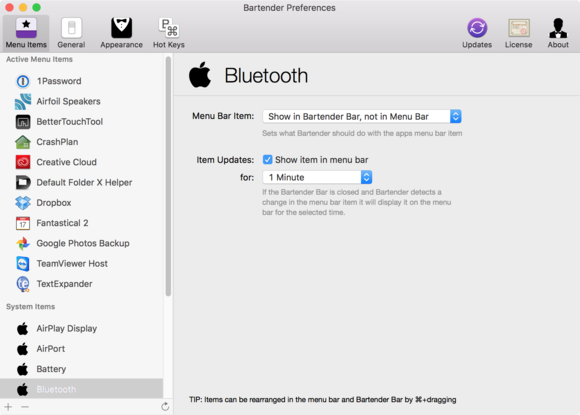 Bartender 2 lets you put menu bar items into its bar or hide them. You can also Command-drag to rearrange all menu bar items, something that isn’t possible without Bartender: third-party apps have to bypass Apple’s restrictions to allow re-ordering and only some do, while certain system items are fixed in place. With a truly enormous number of items in the menu bar, Bartender 2 added a search feature: display the bar by clicking its icon or using a keyboard shortcut, start typing, and matches that have been relegated to the bar appear, and can be selected by pressing Enter. If you have a wide-enough screen—I’m typing this on 1920 by 1080 (1080p) display—you might find Bartender unnecessary, as few applications splay so many text menus at the left that they march across such a wide expense to block drop-downs at the right. But certain software has an inordinate set of menus. Or you may like to have the options there to avoid a trip into System Preferences or a software launch, keeping options handy but out of sight.